Air source portable heat pumps are the most efficient way to employ spot heating in a wide range of uses. Portable heat pumps can produce far more heat than electric space heaters – about 3 times as much heat, while operating more efficiently. These units are also safer than electric space heaters which present obvious fire hazards. 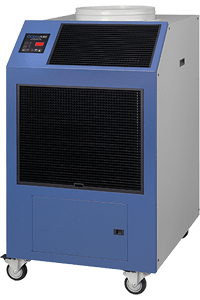 What is a Portable Heat Pump? A portable heat pump works in the opposite way a portable air-sourced air conditioner works. Portable heat pumps are a relatively new technology which enables spot heating (and often cooling as well) in a wide range of environments. OceanAire manufactures a range of portable heat pumps to suit various applications. Whether for emergency heating or to provide temporary heat in any space, we manufacture a product that will suit your heating needs quietly and efficiently. A portable heat pump works like a portable air conditioner but in reverse. Instead of discharging the hot air ‘byproduct’ through ducting to an external outlet, a portable heat pump disperses hot air into the room. Using the ambient air to heat a room is a far better way to warm a space. Quiet and efficient portable heat pumps from OceanAire are quality built to last and are made in the USA for years of commercial and industrial heating applications. Oceanaire’s 20ACH is a portable air conditioning that can provide emergency heat and emergency cooling capabilities. This unit offers the utmost in commercial and industrial heating and cooling power and efficiency. Whether you’re up against the coldest winter or hottest summer, the 20ACH is an American made emergency heat and cooling unit that will deliver – year after year. The 2OACH models range in capacities from 12,000 BTU/HR to 60,000 BTU/HR to satisfy most space cooling or heating requirements.